R.F. Do you feel you are working with an inherited language? H.P. I think by looking at other paintings things do filter through. I probably do make references to other kinds of paintings but it is not something I do consciously. R.F. The actual language of mark making, in the school of such and such Do you see yourself within a tradition that has been passed onto you by recent artists? G.H. Or artists you relate to from the past as well? H.P. Tradition and what one admires cannot be ignored, but I am not really interested in “making references”. The decisions I make that determine the way I paint have less to do with aligning myself to certain ways of painting, than with the actual process of discovery through making. G.H. Do you feel that is the way you make it your own language? H.P. Yes. I can look at other paintings and painters and I see similarities, and no doubt there is influence of a subliminal kind. I don’t think it is something you can actually say: “I make marks because somebody else has made marks that are similar”. I think it is something that is really personal. All the paintings that I’ve seen that I admire are ones in which the marks do seem personal. R.F. So it is really that the marks have a meaning of their own that is not connected to a way of viewing things? It’s actually contained within itself. H.P. Yes. Marks for me do have an inherent meaning, an autonomy. But then marks and structure are inextricably linked of course. And this is to do with my way of viewing things. G.H. How does this develop within subject matter? H.P. Many of the paintings are still strongly rooted in the response to place and to natural phenomena. But whereas in earlier work I was concerned more with how somewhere looked and felt to me, now I am more interested in the sensory experience as well. I am trying to make marks that are the equivalents of this. Equivalents for different matter, densities, weights and spaces I hope to evoke. R.F. A sense of place? H.P. I was brought up in Scotland and spent many holidays in the North of Scotland and Northumberland. Visits to Czechoslovakia and Turkey have been very important to me. I’ve always responded much more to landscape than man-made environments and that is what I’ve painted about it in very different ways. I used to do watercolours directly from landscape and I still do, but now I feel I am tapping other resources as well, allowing experience to filter through in less conscious and predictable ways. I am making paintings which are far less pre-determined. Trusting to instinct far more. The paintings are more to do with imagined place but I still see it has direct references to the seen world and past experiences. I feel that it is always important to go back to the source and work directly. H.P. Because I feel there is a danger for me at this stage to drop this keystone, this springboard. R.F. Where do you go when you are in London to draw? H.P. I don’t really do much drawing in London. It seems cut off from the natural environment. I go walking in the parks but it’s somehow not quite the same. G.H. It doesn’t evoke the same atmosphere? H.P. No, it’s very different. I see now there is probably some element of nostalgia in what I do. There is a desire not to let slip an experience that has been important for me. Through the act of painting however, this becomes something positive and forward looking. One is not only re-creating but creating afresh. This is the joy–when a fusion occurs between the present now–in the act of making–and the past transitory experience. So it is not just preservation. R.F. There is The Neo-Romantic Painting School. Would you feel uncomfortable as part of that tradition? H.P. Yes, I think I could see a connection. However I am a bit suspicious of schools because it is in the end too easy a way of justifying what has been done. Having said that, it can be helpful if one is aligned to certain groups, to make oneself consider just exactly what one is communicating. R.F. Is it subject matter that can be seen as very reactionary? H.P. I think you must make paintings about what moves you, what you feel strongly about. I don’t think any passion is reactionary. It is of now. G.H. When you go out and draw from landscape or draw on the atmosphere of a place, what specific decisions do you make when you bring it back to the studio? H.P. I suppose they are fairly separate. When I did go and paint directly from the landscape I’d have a sketch book and later I would try to work directly from those gouaches or watercolours. But this was unsatisfactory because it was almost like trying to reproduce an immediate response that was twice removed from the subject. R.F. Is it Eliot’s idea of ‘objective correlative’, the idea of re-creation? I always feel when I am in a natural environment that you can’t possibly use a representational language, you can’t contain it. H.P. Yes. Depicting the scene is totally inadequate. I also found that the last time ! was up in the Highlands, I worked a lot from objects that I found because I felt too much in awe of what I was seeing. So in a way I was trying to focus in on things close to the ground; a tangle of growth, a piece of moss, a stone. Somehow in examining each small stone, one is examining its entirety. G.H. what about the use of paint? Do you feel that you could use the medium for itself?. H.P. I feel wary when that happens, I am still rather taken aback when something that has arrived qute spontaneously seems to work. I think it is a question of self-trust as much as anything else. Often though I think my paintings accrue meaning for me through the process of stating, eliminating, restating. I am hoping to achieve an equivalent of the processes of growth and decay in these paintings. I need quite a length of time to build up the identities of the different elements within the painting. I am becoming interested in the different speeds and densities that marks can have. Their ‘sound and smell’. R.F. Tell me about scale. The smaller paintings seem outside paintings, airy, lighter. The larger ones, which are darker, seem more closed in, interiors. H.P. This is changing. The most recent large paintings are becoming lighter too–as concerned with absence of mass as its presence. I want to be able to feel the passage of air in these paintings. They seem to be expanding outwards now in contrast to the earlier paintings which had more of a sense of enclosure. I now feel a lot freer wth the smaller paintings–more like the pages of a sketch book, idea, where speed is quite important, where I can work out specific ideas. You can make major changes much more rapidly on a smaller painting so they are much more fluid. Things grow and change and decay very rapidly, whereas in the larger paintings they are rooted in each stage for quite a long time. I don’t feel somehow that they are so alive and that is something I want to work on. After you have been working a certain time on something, areas begin to take on a certain reality even though they may not be what you want. It seems such an act of destruction to work over areas but I think it’s very necessary. R.F. The American painter Susan Rothenberg says that she is painting from her unconscious: if she were to be conscious of what she were doing it might halt her production, when you said it comes from an experience that you have had and have assimilated in the back of your mind, what is conscious or unconscious? H.P. I think it is important to paint what you mean, but that also implies that it is conscious. The paintings that work best for me are the ones which do give a feeling of experience in response to a place or natural phenomena. The last paintings I can look consciously back at and say yes, that meant something to me. I think the ones that I feel most excited about are the ones which haven’t consciously been done. There is something unknown there and so there is still room for discovery, that’s what I find exciting. R.F. What do you feel about other people’s experience of your paintings? H.P. I find it quite frustrating, the concern with what something is rather than how it is. Questions such as “What is it?” are asked, as if what is figurative seems more important than communication through different languages. That’s quite devaluing. R.F. There is a process of denial going on where someone is looking at the picture, and you’re denying them something to grab hold of, although obviously you’ve provided them with something much larger. Is that a conscious move? H.P. I do think about it, but at this stage it seems more important to resolve things for myself before I start to worry too much about how the work communicates with other people. It takes quite a long time to assimilate what you’ve been doing in a way and be sufficiently distanced from it. Ultimately I hope that my paintings will be able to communicate more directly. G.H. What painters do you feel have influenced your work? H.P. I think that Turner has always been there in the background. 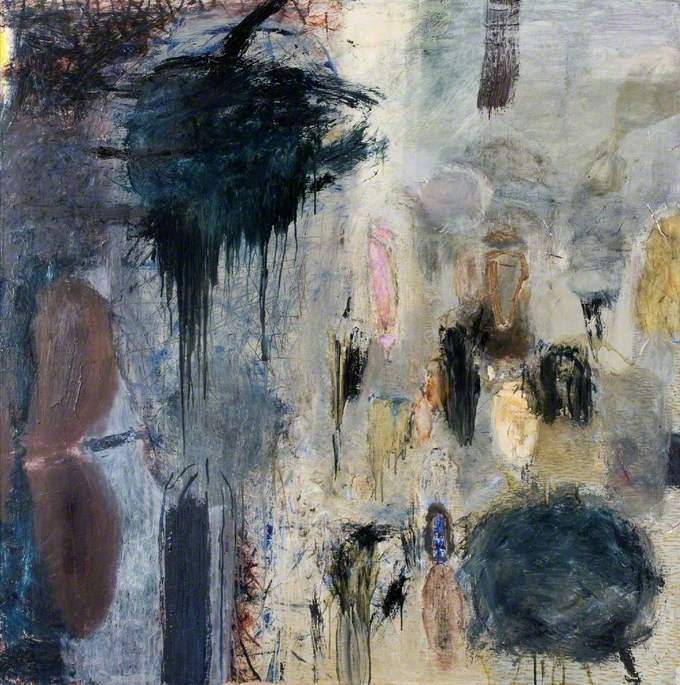 William Johnstone and Joan Eardley. But lots of different people for different reasons. I saw the slides at your talk of Helen Frankenthaler–I find her work interesting. R.F. Yes, she worked on the floor. You work on the floor? H.P. Yes, I’m working with thin washes so working on the floor is for practical reasons. But I also enjoy being able to walk around the painting to see the painting from all different sides. These paintings are all square so I often defer the decision of where top and bottom are. Maybe this is why it’s often difficult to distinguish between what is rising and falling in the paintings. R.F. Tell me about how you use colour. H.P. I have used it in a very referential way but now it is more to do with a sense of light and how I want relationships to exist within the painting. R.F. Do you give your paintings titles? H.P. Sometimes, but I find it difficult. They always come last. I suppose that it could help in some way, giving a lead into the paintings. The last I called “Germinations”. I painted it in the spring time when everything starts growing again. H.P. Yes. I’ve recently been reading Seamus Heaney. I enjoy the sheer sound of the words and the way their meaning relies on their sound and rhythm. You get a really strong sense of personal history in relation to the physical nature of things and to the land. I also like W.H. Auden.